Sometimes, I’d like to bring more focus to the main subject or object in my photo…don’t you? One of the ways to do this is to create an illusion, of course! Basically, it is creating the appearance of a smaller cropped version of the photo within its larger self, using the vector shape, creating a clipping mask and adding some aesthetic effects with the Layer Styles. The end result seems quite similar to a collage of a single photo, though in this case, using a vector shape offers more flexibility in that it can be moved, resized or rotated without affecting the quality of the image it encompassed. Step 1. In Photoshop CS2, open the image that you want to use for this tutorial – Choose File > Open and browse to select your image. You will need to duplicate the opened original image as it is unwise to work on it. With the original image activated, choose Image > Duplicate (a duplicate window pops up, type a new file name as you wish) > OK. Close the original image and make very sure you are now working with its copy. Check image size and if necessary reduce its size to 800 x 600 pixels which is the recommended size for web publishing – go to Image > Image Size and key in the dimensions as you would want the completed image to be. Step 2. At the Layers Palette, the Background layer is selected (highlighted in blue) and you’ll need to duplicate it. Go to Layer > Duplicate Layer > OK or press the shortcut keys Ctrl+J to bring forth a Background copy (Layer 1). Double-click on the words of the layer to change its name to ‘Mini Picture’ for ease of identification. Step 3. Now, you’ll need to create a new layer below the Mini Picture layer. To do this, simply hold down your Ctrl key while you click the New Layer icon at the bottom of the Layers Palette and a new layer will emerge between the two layers – Background and Mini Picture. Double-click on this new layer and rename it ‘Vector’, as this is where a vector shape will be created. Step 4. Next thing to do is to define the shape of the mini picture using any one of the Vector Shape tools. 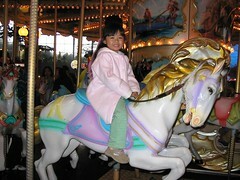 In this example, I’ve dragged out a rectangular shape around the sweet little girl and the horse’s top portion. With the Vector layer selected in the Layers Palette, choose the Rectangle Tool from the Tool box on the left (the Vector Shape tools are located directly under the Type Tool), then click and drag it over the image area that you’d want your smaller version picture to represent. If the tool is not visible, click at the location and hold down the mouse button to select your tool from the fly-out list. The shape to be drawn need not be precise, just an appoximate one will do since you can transform it later. Once the vector shape is drawn, you’ll observe that the Vector layer in the Layers Palette has changed, creating 2 thumbnails – a color box for the layer and another for the vector mask. You can click on the vector mask thumbnail to toggle on and off. Step 5. Now, you may want to reposition, resize or rotate your vector shape as desired. With the Vector layer still highlighted in blue (and the vector mask thumbnail highlighted too) in the Layers Palette, press Ctrl+T to bring out the Free Transform box and handles around the mini picture. To reposition the vector shape, click anywhere inside the box and drag the shape to your desired location, or nudge it with the arrow keys on your keyboard. To resize it, simply click and drag any of side handles or constrain the proportions by holding down Shift as you drag a corner handle, and holding down Shift+Alt as you drag will cause the shape to resize from the center. Should you need to rotate the shape, move your mouse anywhere outside the box and when the cursor change to a double-sided arrow, click and drag as desired. To complete the transformation, press Enter or double-click inside the Free Transform box. To cancel the operation, press Esc and try again. Step 6. You’ll then need to use the vector shape to create a clipping mask. This means that it will clip the layer above it into the dimensions of the smaller cropped version of the picture. To do this, hold down the Alt key and move your cursor directly between the Mini Picture and Vector layers in the Layers Palette until you see your cursor change into the clipping mask icon. Then, double-click to create the clipping mask. You will know that you’ve done it correctly when the Mini Picture layer is indented to the right, confirming that it’s clipped by the vector shape below it. Step 7. Now the real fun begins when the mini picture is being dressed so to speak. You’d need to enhance the smaller image and bring it into focus by adding a few layer styles to the vector shape. 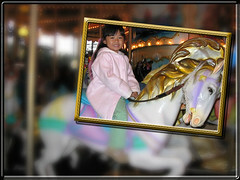 Unsurprisingly, fanciful photo frames (borders) can be created with the combination of these few blending effects. In this example, I’ve applied a Stroke, Bevel and Emboss, and Drop Shadow. (a) Stroke is the simplest way to add a border to any photo. With the Vector layer and mask thumbnail in the Layers Palette still being selected, click on the Layer Style icon at the bottom of the palette and select Stroke to open the Layer Style window and stroke options. Check that Preview (on the right side of window) is selected to allow you to view simultaneously the effects of your choices made on image itself. 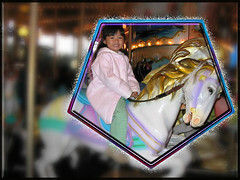 Here, I’ve set the following options: Stroke size – 15px, Position – Inside so that the stroke appears within the boundaries of the vector shape, Blend mode – Normal, Opacity to 100% and color #c3930d (the color taken from the horse’s mane – click on the color box to open the Color Picker, then use the Eyedropper Tool to select the color from your image and click OK when done). Do not close the Layer Style window yet as there are 2 more layer effects to be applied. (b) Bevel and Emboss, to give dimension – click on the words Bevel and Emboss on the left side of Layer Style window to open its options for you to choose. The choices made were: Style – Inner Bevel, Technique – Smooth, Depth – 100%, Direction – Up, Size – 18px, Soften – 0px, Angle – 120º, deselect Global Light, Altitude – 30º, Gloss Contour – Linear, deselect Anti-aliased, Highlight Mode – Screen, Color – White #ffffff, Opacity – 75%, Shadow Mode – Multiply, Color – black #000000, Opacity – 60%. Also, click on the word Contour on the right side of window, and for Contour – pick Sawtooth 1 (click on the drop-arrow to open the Contour Picker to make your choice), deselect Anti-aliased, Range – 23%. (c) Drop Shadow, to give depth – click on the name Drop Shadow to bring out its options. Selections made were: Blend Mode – Multiply, Color – Black #000000, Opacity – 100%, Angle – 135º, select Global Light, Distance – 12 px, Spread – 0, Size – 6 px, Contour – Ring-Double, deselect Anti-aliased. You can now close the Layer Style window by clicking OK if you’re satisfied at this point with the photo effects (I was! ;) ), otherwise continue below! (d) Others – you can try out as many Layer Styles as you want by clicking on the name of the various Layer Styles to open their options for selection. Enjoy trying out the many styles+options available and you’ll be amazed! If you want to cancel them, just deselect in the box to the left of their names. When you’re finally satisfied with all the styling results made on your photo, just hit OK to accept and close the Layer Style window. Of course, do not forget to save your styling efforts as a New Style (button displayed on the right side) for future use, before exiting from the window. Should you change your mind on any of the layer effects applied, just return to it by double-clicking on the Layer style button (letter f with a circle) in the Layers Palette and make the desired changes. Step 8. We can now move on to complete the background photo, now that the creation of an illusive mini picture within its bigger image has been done. Here, I had diminished focus on the background picture by applying a simple Gaussian blur so that the main subject remains the center of attraction so to speak. To do this, you’d need to duplicate the Background layer again – select the Background layer in the Layers Palette and press Ctrl+J. Then, double-click on the new layer’s name and rename it ‘Main Picture’. Next, go to Filter menu > Blur > Gaussian Blur and type in 8.0 px for Radius when its window pops up, then hit OK to accept. If you want to undo blur, simply press Ctrl+Z and try again. Sometimes, if I think that the blur needs to be slightly adjusted, I’d just go to the Opacity setting in the top right corner of the Layers Palette, let the cursor rest on the word Opacity to turn it into a slider icon, then click and drag to the left to lower the opacity. Here, I’ve lowered it to 90% which seemed just right to balance with the vector-shaped mini photo. (a) Stroke – set the following options: Stroke size – 10px, Position – Inside, Blend mode – Normal, Opacity to 100% and color #070502 (a dark color picked from the main photo, using the Eyedropper Tool). (b) Bevel and Emboss – the choices made were: Style – Inner Bevel, Technique – Smooth, Depth – 150%, Direction – Up, Size – 15px, Soften – 0px, Angle – 135º, select Global Light, Altitude – 30º, Gloss Contour – Linear, deselect Anti-aliased, Highlight Mode – Screen, Color – White #ffffff, Opacity – 100%, Shadow Mode – Multiply, Color – black #000000, Opacity – 100%. Also, click on the word Contour on the right side of window, and for Contour – pick Rolling Slope-descending, deselect Anti-aliased, Range – 30%. YIPPEE! THAT’S ALL…FINISHED! SCROLL UP TO SEE THE END RESULT! If you’re game to follow through another try-out, read on! I just couldn’t resist creating another style! Hmm…Photoshop photo effects are so diverse and amazing! Exciting too, though can be too consuming a passion! ;) This colorful mini picture was done to celebrate the beauty and sweetness of innocence and youth as displayed by my adorable grandchild! Steps taken were quite similar to steps mentioned in the tutorial above. The stark differences being the vector shape was drawn with the Polygon Tool instead and options selected in the Layer Styles were varied to create an appealingly colorful theme! (a) Stroke – Size 10px, Position – Center, Blend mode – Difference, Opacity to 100% and color #52c4f1 (color selected from the mini photo with the Eyedropper Tool). (b) Bevel and Emboss – Style – Inner Bevel, Technique – Smooth, Depth – 80%, Direction – Down, Size – 15px, Soften – 0px, Angle – 120º, deselect Global Light, Altitude – 30º, Gloss Contour – Linear, deselect Anti-aliased, Highlight Mode – Screen, Color – #7a33f6, Opacity – 100%, Shadow Mode – Multiply, Color – black #000000, Opacity – 100%. Also, click on the word Contour on the right side of window, and for Contour – pick Rolling Slope-descending, deselect Anti-aliased, Range – 36%. (c) Outer Glow Blend Mode – Dissolve, Opacity – 100%, Noise – 0%, Color – #e7f4f9, Technique – Softer, Spread – 0, Size – 25 px, Contour – Linear, deselect Anti-aliased, Range – 50%. Learn more about vector shapes and other Photoshop effects from Bloomsberg University Virtual Training Center. Nice post. Learning photoshop was not that hard to figure out once I went through a couple good training courses. Enjoy, keep learning and keep smiling!